Don't wait till the last minute to buy your holiday baking products! Tupperware Bowls on SALE! Buy 1 Set - Get 1 Set! Buy 1 set of 4 Tuppperware Bowls and Get One Set of Tupperware Bowls! Great for gifts! 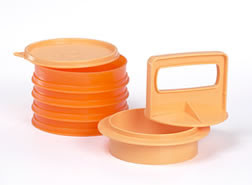 Tupperware's famous Hamburger Press is available right now on the Tupperware website. The special one-piece patty press features an open handle, easy to grasp and use. It makes quick, uniform hamburger patties with absolutely no mess. Plus, you can prepare hamburger patties ahead of time and then store in the freezer for later use. The 1½"/3.8 cm deep press ring lets you create thin or thick patties that are always uniform in diameter. Each keeper holds up to 1/3 lb. of uncooked ground meat. the hamburger patty keepers are stackable in the fridge, as the groove on bottom forms a seal for the next keeper on the stack. Tip: To eliminate shrinking or raw-in-the-middle hamburger patties, make a "finger hole" in the middle of each before freezing. Burgers will cook evenly and shrink less. This set also doubles as a great ice cream cookie maker! Buy the Tupperware Hamburger Press now while it is still available! Tupperware: Last chance for Summer savings! Please visit Tupperware.com to Open a Gift Registry, View Our Online Tupperware Catalog, learn how to Earn Free Tupperware or Become a Tupperware Consultant. The Tupperware Hamburger Press will be GONE so get it now if you want it!!! Tupperware Retiring Products! GO NOW! !